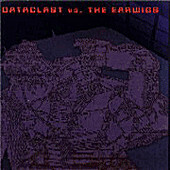 DATACLAST is the world's first and finest digi-grind combo. Using nothing but computers and vocals so sick that Lucifer himself is jealous, the band spews out hyper-thrashing grindcore. Yes, they use nothing but computers, but no, it doesn't sound like they use nothing but computers. The music is heavy, violent and more "real" than half the traditional grind bands in the world. Computers allow the band to avoid any limitations of speed, distortion or creativity. They can, and do, do it all. Everything madhouse grind fans wished would be incorporated into grind, DATACLAST incorporate. THE EARWIGS, by contrast, construct and arrange noisescapes that are haunting and creepy. Dark and industrial both seem like adequate adjectives. An interesting, yet ultimately effective band to pair with DATACLAST.